Welcome to your December propertybuyer market update. December is a great month...the anticipation of Christmas day celebrations, the joy of looking forward to an extended holiday, time away from the pressures of work and the optimism of a New Year. The RBA gave borrowers an early present this year with an interest rate cut in December of 0.25% which will help lift confidence and activity in the property market. December draws a line in the sand and creates a deadline for buyers and sellers to make decisions. Vendors are anxious to secure a sale with a signed contract so they can relax over Christmas and celebrate their sale. Buyers are keen to lock in a purchase and secure their next home for the New Year. So my tip is while everyone else is winding down, it's time to get active and find that ideal property. There is less competition from other buyers during the December/January period which means better buying opportunities. The limiting factor is the number of listings on the market. However, there is still an over-hang of listings that carry over to the New Year. Vendors that have had their property listed for a long time will generally become more motivated to take an offer as they become frustrated with "the market". Talking about the market, we have seen a steady pick up in market confidence in the last few months across a range of indicators. Consumer confidence has risen 5% according to the latest figures by the Westpac-Melbourne Institute. The HIA-CBA Affordability Index for the September quarter has shown that affordability is at its best level in the last three years (and 15% better than a year ago). Steadily growing incomes, falling interest rates and easing dwelling prices have seen housing affordability improve. Auction clearances rates in both Sydney and Melbourne have been mostly tracking above 60% for several months indicating a healthier market gathering momentum. Finance approval figures are also showing signs of upswing with loan approvals to owner-occupiers up 5.5% and investors up 4% in the last quarter. But we are seeing the retail and building sectors still languishing. Consumers are not spending as much as they used to nor are builders seeing a recovery in demand for new construction. Around the major capital cities we have seen a mixed bag of results. The latest figures from RP Data-Rismark home value index have shown that Darwin has led the way this year with a 13.1% increase in median prices over the year to November 30. By contrast, Hobart was the worst performer with a -7.0% decline, Adelaide down -3.5% and Melbourne down -2.5%. 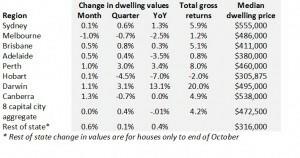 Perth saw an increase of 3.4%, Sydney up 1.3%, Brisbane up 0.3% while Canberra stayed neutral. RP Data Senior Research Analyst Cameron Kusher said that the current market conditions reflect the road to recovery. 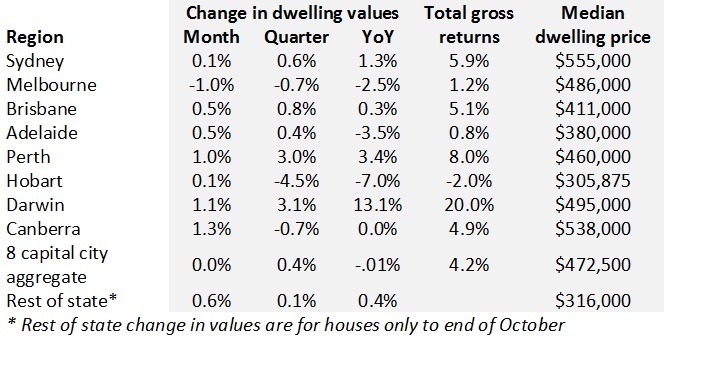 "Home values in Brisbane and Perth remain below where they were five years ago whereas the other mainland cities have all increased over this period. This has meant that relative to the other capital cities, Brisbane and Perth have experienced affordability improvements and subsequently we may see them become more popular from both an owner occupation and investment perspective." Mr Kusher said. Melbourne is likely to remain a weak market given the potential for over-supply, while Sydney is expected to see stronger capital growth rates in response to under-lying demand and constricted supply. In summary, December is a good month to make a move on a quality property by capitalising on the rush to get things finalised before Christmas. "If you get a buyers' agent you click with, it will make life a whole lot easier!"